The terms and conditions for use of the FabFox.co.uk web store are detailed below and should be read carefully. The terms may vary from time to time. We advise that our terms are checked before every new purchase. Please be advised that any use of this web store or purchase made using this web store constitutes an agreement to abide by the terms and conditions outlined below which shall override any other terms and conditions. All contracts and/or agreements formed between you and FabFox.co.uk (Fabulous Fox Ltd) by means of using this web store shall be governed and construed according to English law and any disputes or proceedings shall be subject to the exclusive jurisdiction of the English courts. At FabFox.co.uk we try to portray all of our products at their best. Because people view websites in different ways; monitors, tablets, smartphones etc this can result in the resizing or distorting of some images in some circumstances, therefore we cannot guarantee that all images on the FabFox.co.uk web store are an accurate representation of the tangible product. We try our best to ensure all of our products are portrayed accurately and would ask anyone unsure of making a purchase to enquire with us before purchasing. At FabFox.co.uk we’re here to help. If you have any queries regarding any of our products please don’t hesitate to get in touch. Once you have placed your order your funds will be ‘pending’, meaning they will temporarily be seperated from your main balance. Once we have the product in stock, we will then debit your account with the amount authorised. If we already have your items in stock we will post via Royal Mail. Usually this should take between 1 and 3 business days however we aim to deliver within two business days if the product is ordered before 13:00 GMT. Please check the tracking number provided as this should give you an indication of delivery date. Once we have received despatched the goods then ownership will be transferred directly to the purchaser. In some exceptional circumstances, Royal Mail may not have delivered your item when you were expecting. At FabFox.co.uk we pride ourselves on our efficient and secure delivery and would ask that you contact us as soon as practicably possible and we will help to trace the order. As part of our terms and conditions, we’d ask that you inspect all goods before signing as any signed for good will be deemed as ‘delivered in good condition’ and may effect your ability to make a claim. When you place your order with FabFox.co.uk, we automatically check your card for authorisation with your card provider. Once we have confirmed that the item is in stock we will debit the payment from your account and the goods will be sent once the payment has been debited successfully. To prevent fraud we check customer supplied information against publically available information when processing customer orders (e.g. Electoral Roll data, Credit Reference Agencies). We have stringent fraud prevention measures put in place to keep our customers secure and to deter fraudsters from using our services. We reserve the right to use a third party to conduct these checks on our behalf. By ordering goods from the FabFox.co.uk website you consent to such checks being made. We may (in some circumstances) need to contact you by telephone, letter or email to verify details before we are able to process and despatch your order, or we may be unable to accept your order. Any information disclosed may be sent to a registered Credit Reference Agency which may keep a record of the information. By purchasing goods from us you consent to these checks being carried out. We may from time to time offer the use of vouchers/coupons on our website. All coupons/vouchers will have an expiry date and individual vouchers/coupons should be used once per individual. We have processes in place to ensure vouchers and coupons are not misused and we reserve the right to terminate accounts if we suspect voucher/coupon misuse has occurred. On rare occasions a mistake may be made where more than one voucher or offer are combined without our prior knowledge and upon detection of such unintended use, we reserve the right to cancel the order and refund the transaction. Normal terms and conditions for using FabFox.co.uk apply except when they conflict with these terms and conditions. Our terms and conditions do not affect your statutory rights. 5. FabFox.co.uk reserves the right to alter the selling price or withdraw this offer at any time at our discretion. 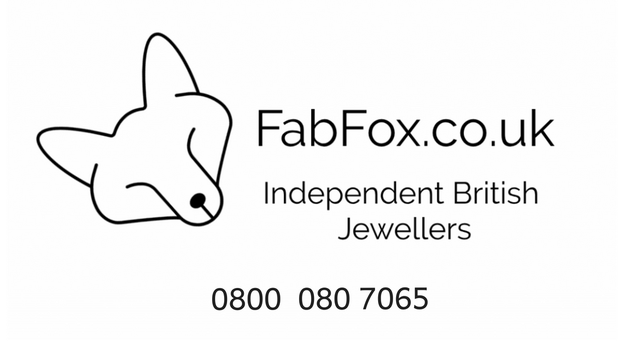 At FabFox.co.uk we pride ourselves in delivering quality jewellery to our customers. In rare situations you may find you would like to exchange or return an item purchased from our web store, please get in touch as soon as possible and we can assist you. We may have a replacement item in stock in our store. On the day you receive your product you will have 14 days to request a refund or return (this does not apply to pieces which have been customised, e.g. the piece has been ordered in a specific metal, a certain size, with gemstones or with custom engraving). When posting your product to FabFox.co.uk returns department, we will refund the original postage price if the item is faulty or significantly not as described. You will have 14 days from the date that the refund has been accepted to post the item to us, items delivered after this period may not be eligible for a refund. Under the Consumer Contracts Regulations, you are provided the right to cancel your order with us at any time within 14 days of receiving your goods. Fabulous Fox Ltd are the Copyright holders to all content on this site; excluding content from third parties e.g. product photographs etc. Fabulous Fox ltd holds the rights to all design, copyright and published material on FabFox.co.uk web store. You are allowed to download and print content from this site for media related purposes or for your own personal non-commercial use only. This is subject to the material being reproduced accurately and not being used in a derogatory or demeaning manner or in a misleading context. Where this material is reproduced, published, broadcast or otherwise issued to others the source and copyright status must be acknowledged. The permission to reproduce FabFox.co.uk press releases does not extend to any material on this website which is identified as being the copyright of a third party. No right, title or interest in any downloaded materials or software is transferred to you by such downloading. You may not make any other use of material on this site (including reproductions, publication, alteration, distribution, broadcast or any other exploitation except as above) without our written permission. This site is provided on an “as is” basis without making any warranties or representations of any kind with respect to this site or its contents and FabFox.co.uk disclaims all such representations or warranties. In addition FabFox.co.uk makes no representations or warranties about the accuracy or completeness of the data contained on this web store. These disclaimers do not exclude FabFox.co.uk of liability for matters which may not be excluded under any applicable national law. Neither FabFox.co.uk nor any of its directors, employees or agents shall be liable for damages arising out of or in connection with the use of this web store. This is a comprehensive limitation of liability that applies to all damages of any kind, including (without any limitation) compensatory, indirect, direct or consequential damages, loss of income, data or profit, loss or damage to property and claims from third parties. FabFox.co.uk does not exclude any liability for death or personal injury resulting from its negligence or the negligence of its directors, employees or agents. FabFox.co.uk cannot be held responsible for any losses you may incur in transmitting information to us by internet link or by e-mail. Any such loss shall not be borne either wholly or partly by us, and shall be entirely your responsibility.